Disputes with clients often arise due to several factors, including design, material, specification, and workmanship issues. The top ten building defects identified in Australia last year included waterproofing, brick and mortar walls, and finishes. Variations to building contracts are also a constant source of dispute. 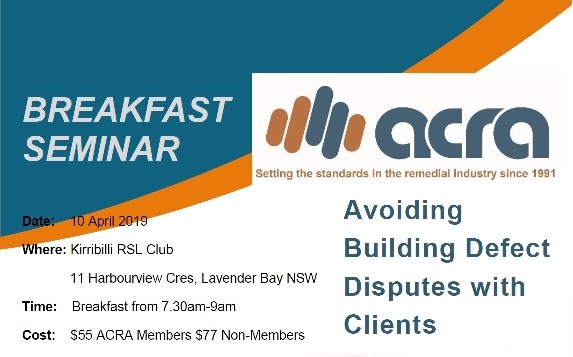 Our next seminar on 10 April 2019 will provide practical tips for those working in this industry to endeavour to improve relations with clients and avoid these types of disputes, or better protect yourself where the dispute proves unavoidable. Your speaker Paul Jurdeczka is a Partner at Chambers Russell Lawyers who practices in commercial litigation and dispute resolution, with a focus on building & construction, insurance and strata. Click here for more detail and to register.